First Impressions Window Cleaning, Inc. - First Impressions Window Cleaning, Inc.
First Impressions Window Cleaning, Inc.
First Impressions Window Cleaning, Inc. began servicing Charlottesville, Albemarle, and surrounding communities in August 1995. Since beginning in Charlottesville, we have expanded to include Harrisonburg, Staunton, Waynesboro, Augusta County, Rockingham County, Rockbridge County, and surrounding communities. At First Impressions, window cleaning is the only service we provide and we take great pride in our work. Our employees are courteous, conscientious, caring, and exceptionally skilled at window cleaning. We come prepared for every job with the best equipment and knowledge of your windows to make each experience a pleasant one. Much of our residential and commercial business is made up of repeat customers and referrals, which is a testimony to our ongoing customer satisfaction. We welcome the opportunity to give you a free estimate and look forward to serving you soon. Charlottesville, Harrisonburg, Staunton, Waynesboro and surrounding communities. 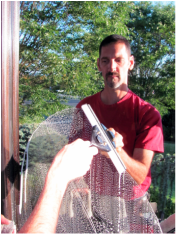 © 2014 First Impressions Window Cleaning, Inc.